Aging curves are very popular on baseball analytics sites like Fangraphs and Baseball Prospectus. They give a forecast as to how a typical player ages over time and how their batting average, WAR, or some other statistic might change with the seasons to come. They give a best guess as to how a player will age, so while it is by no means a perfect representation of player aging, it is helpful. The real benefit of aging curves are that they can help us forecast a player’s (or driver’s in our case) performance in future seasons based on how he’s performed so far. No one has really tried to do the same for IndyCar, though David at Motorsports Analytics has done something similar for NASCAR, so I thought I’d give it a try. The basic technique behind constructing an aging curve is this: look at back to back seasons for many different drivers and see how a statistic (for example average finishing position or AFP) changes between those years. Put these “changes” into a bucket representing the ages, find the average change from say age 32 to 33, and then do this for all of the age pairings in your data set. For example, in 2013 Scott Dixon was 32 years old and had an average finish of 8.2. The next season he was 33 and had an average finish of 8.3, so his change between ages 32 and 33 is +0.1 average finishing position. This would go into the general 32/33 bucket for every driver who raced in back to back seasons at those ages. Once all of the 32/33 changes are put into the bucket, the entire bucket is averaged together to get the average change for a typical driver between those ages. This is called the delta method for constructing an aging curve because it looks at the average change from one year to the next in back to back seasons. I created three different aging curves for IndyCar drivers. One for average starting position, one for average finishing position, and one for championship position. I looked at 43 different drivers. To be include in the data set, the driver had to race in at least two back to back seasons from 2002-2017 and race in at least five races each season. This provided a total of 273 seasons from which to develop the aging curves. Here is a look at the aging curve for average finishing position. If you have ever seen an aging curve for baseball before, you might be a little confused by this. In baseball, players want to have a high batting average or WAR, but in racing and with the statistics we’re looking at, you actually want a lower number. So the aging curve looks flipped when compared to this one for baseball. The y-axis is the change in average finishing position from peak year. Moving down the y-axis indicates a decrease in averaging finishing position (ex: moving from an average finishing position of 17th to one of 11th). For example, when a driver is 23 years old, he’ll be projected to shave a little over four places off of his current average finishing position by the time he reaches age 28 — this is the peak age for average finishing position performance. So if a driver has an average finishing position of 14th when he’s 23, we’d expect him to be have an average finishing position of 10th in five years time, based on how a typical driver ages. This graph also shows the year to year change for different age couplets. Going from age 34 to 35, a typical driver’s average finishing position increases by 0.4 places, meaning he is less successful than the year before. The key to remember when reading aging curves is that an increase in average finishing/starting/championship position is a bad thing (AFP of 14.5 going to 16.7) and a decrease is a good thing (AFP of 20.1 going to 14.2). It doesn’t sound quite right at first, but that’s just the nature of starting/finishing/championship position in IndyCar. 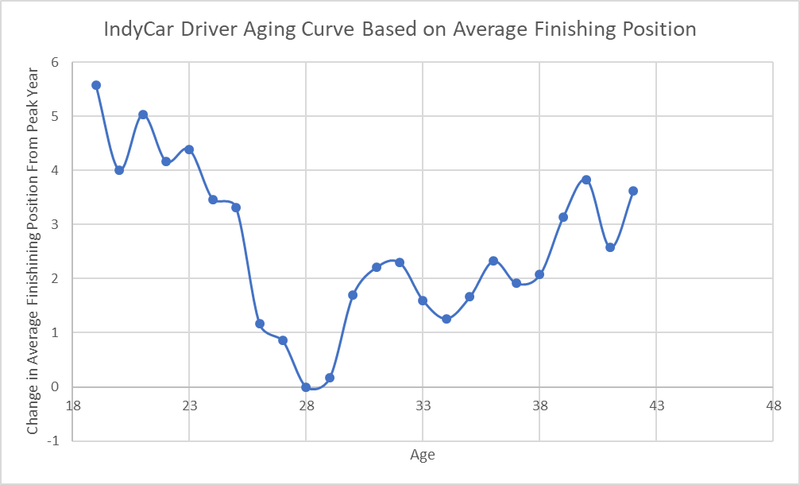 Overall, the average finish curve shows us that drivers drop a little over half a place off of their average finishing position per year until age 28. After that, it is a gradual increase as the driver comes out of their prime years and starts moving down the grid again. Drivers lose their abilities much slower than they gain them, with a fair number of drivers even having better seasons than expected as they get older because of this. The aging curve for average starting position is read exactly the same way as average finishing position, with lower numbers meaning a driver is closer to the peak age performance. What’s interesting about this aging curve is the dip that occurs when going from age 20 to 21, even though the peak age still turns out to be 28. This clearly isn’t what we’d expect to happen from a “typical” driver, and it’s caused by the relatively small sample size of drivers in that age group competing in back to back seasons. When using this aging curve for projections, I adjust for this anomaly by providing less weight to that couplet. Drivers seem to lose their qualifying abilities quicker than their racing abilities: by age 38, a driver has lost about 4 places off of their peak average starting position compared to just 2 places off of their average finishing position at the same age. This speaks to the idea that being consistent and safe throughout a race can pay off in the long run. In qualifying, drivers only need to get through one quick lap to place high. In a race, you need consistent laps and to stay out of trouble for over an hour and a half of racing in order to finish in a good position. Drivers who have a lot of experience are able to maintain high average finishes for a long time because they know this better than the younger drivers who are new to the series. 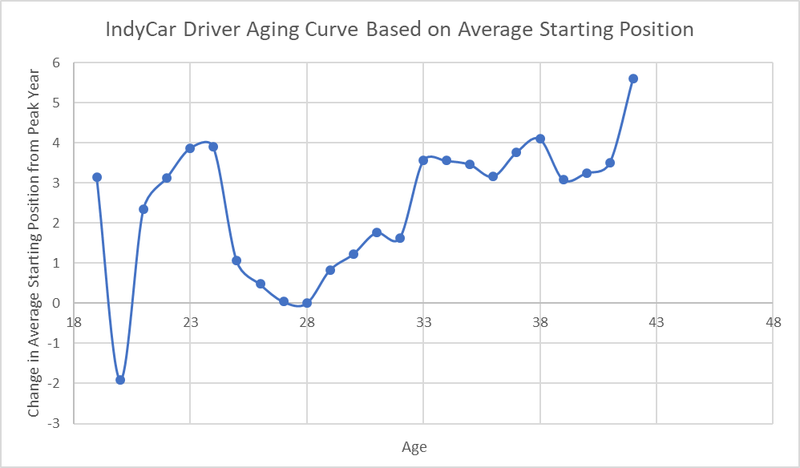 Younger drivers seem more willing to take risks which can pay off in high average starting positions (think of the dip at age 20/21), but these don’t always translate to high average finishing positions as we saw above. It’s much easier to get away with “on the edge” driving for one lap compared to 80. And finally, we have the aging curve for championship finishing position. 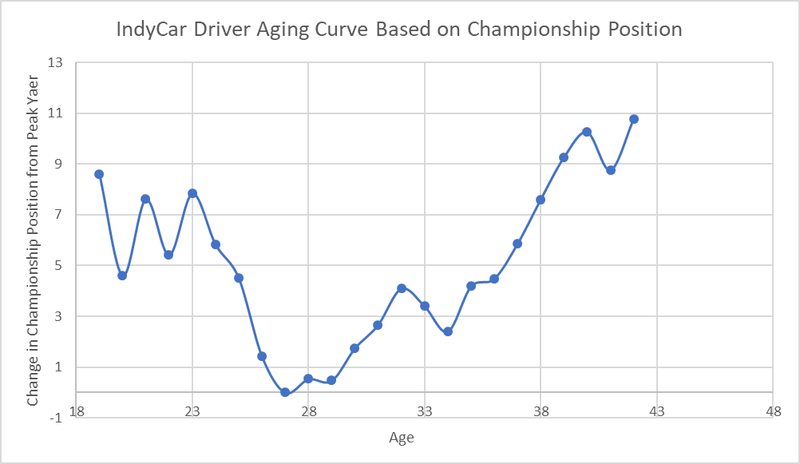 The championship aging curve shows that the peak year for championship position is right around the age of 27. At first glance this might surprise you given that the average age of the champion has been close to year 30 years old for the years 2000-2017, but remember that this is an aging curve for all drivers, not just drivers that went on to win the championship. On average, drivers are achieving one of their best championship finishes around the age of 27. Early on in their careers, drivers experience a lot of variation in season to season performance in the championship. This is likely because a few good results — which might be the result of luck early on — can boost drivers up the standings a lot when they are near the back in points. After drivers hit 23 their performance becomes more predictable throughout the rest of their career. Drivers drop back roughly 0.75 places in the points standings each year after the age of 28. As I mentioned before, aging curves are not a perfect forecast: they are just our best guess based on how typical drivers have aged. One of the main drawbacks of aging curves, and a problem with every sport, is called survivorship bias. This is the idea that only the best drivers will be included in the later age ranges because all of the worse performing drivers will have been let go by then. If a driver isn’t good, he won’t stay in the series for long and he won’t have many back to back seasons to use. This is especially a problem in the first few seasons as new drivers come and go having only raced in one or two seasons. After that things start to even out and the survivorship bias doesn’t matter as much because most of the drivers in the series are typical of the rest of the drivers who have made it that far too. This is something to keep in mind when looking at aging curves. The typical driver peaks in average finishing and average starting position around the age of 28. Drivers lose their ability to have a high average starting position quicker than their ability to have a high average finishing position. This is possibly due to younger drivers’ willingness to take risks in qualifying and the better experience older drivers have in managing race situations. There is a lot of early volatility in how drivers perform in the championship early on in their career. This evens out as their career goes on. Survivorship bias is an important thing to remember when evaluating aging curves. As the season gets closer and the rest of the vacant seats get filled, I will post my projections for the 2018 IndyCar season based partly on these aging curves for each driver’s average starting/finishing position and their championship position. Look out for those! Another great analysis sir. Terrific.